Chrichton's World: Review Triple 9 (2016): Waste of talent and potential. Very mediocre film! 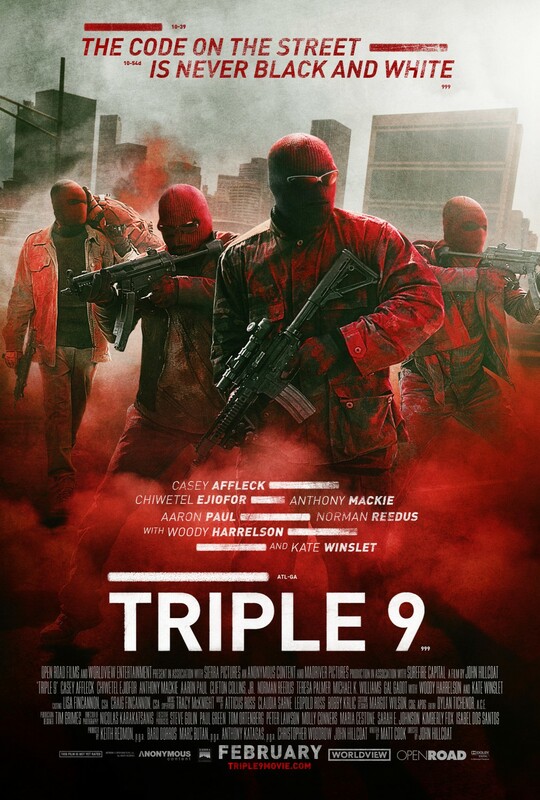 Review Triple 9 (2016): Waste of talent and potential. Very mediocre film! The first thing you will notice is the cast. There are quite a few big names here. Chiwetel Ejiofor, Casey Affleck, Anthony Mackie, Woody Harrelson, Aaron Paul, Kate Winslet, Gal Gadot and Norman Reedus. On top of this you have John Hillcoat directing the film. The man behind Lawless and The Road. With such talents involved you can't go wrong can you? As it turns out you can. Big time. There is nothing about Triple 9 that is extraordinary. Everything is just mediocre. Mind you it is not the fault of the cast. Most of the actors bring their A game. But what is the point of that if they are let down by the direction and story. The story plays out like you would expect. Nothing in it is original or fresh. You aren't even made to care for any of the characters since we hardly get to know what they are about. In this case it is incredibly essential since if there is no one in this film you can root for why would I need to invest time in a bunch of characters I have no interest in. If it weren't for the talents involved I would not have given this film a glance let alone take my time and watch it. Even the action sequences are downright average and predictable. The heists certainly are the highlights in the film but like everything else in the film suffered from mediocrity. I truly wished they weren't. But only a few moments during those heists were exciting. I don't get it. Even if you weren't trying you only needed to flesh out the characters a little more to make it more compelling. Take Kate Winslett for example. She plays a crime boss who is beautiful but obviously is a psychopath. It's only because of her acting talent that we know she is. Why aren't we shown more of how cold and calculating she is? Triple 9 is a real disappointment. Such a waste of talent and potential. This is one of those titles you best to be enjoyed late at night. But I can't recommend it.